Paglia e Fieno means hay and straw in Italian and refers to the combination of egg and spinach pasta dough used in the recipe. Almost any sauce would be delicious with this pasta combination but I really enjoyed what Domenica Marchetti made in her book Glorious Pasta (I love this book). 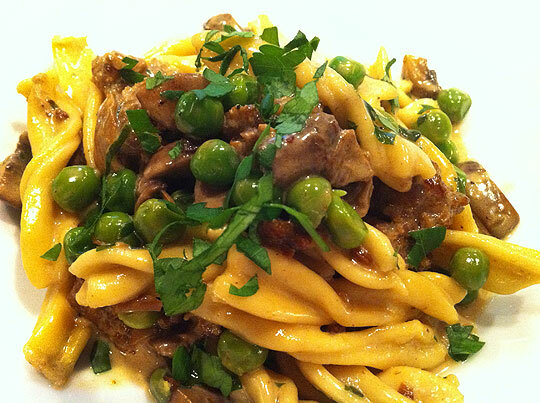 It's a smooth sauce that mixes porcini mushrooms, sausage, peas and heavy cream. Since you probably don't have fresh spinach and egg pasta on hand at all times...don't feel like you can't make this sauce . Any pasta will work...fresh of course is always preferred. Put the porcini in a small heatproof bowl and pour the boiling water over them. Let stand for 20 to 30 minutes, or until softened. Drain the porcini in a fine-mesh sieve lined with damp paper towels/absorbent paper or cheesecloth/muslin, reserving the liquid. Chop the mushrooms coarsely and set the mushrooms and liquid aside separately. Warm 1 tbsp of the oil in a large frying pan placed over medium heat. Remove the sausages from their casings and pick them apart over the frying pan, allowing the chunks of sausage to drop directly into the pan. Sauté, using a wooden spoon or silicone spatula to break up the large pieces of sausage, for 15 to 20 minutes, or until no trace of pink remains and the meat is cook through and just beginning to brown. Raise the heat to medium-high and pour in the wine. Cook for about 1 minute, or until most of the liquid is evaporated. Remove from the heat and transfer the sausage to a bowl. Wipe the frying pan clean with paper towels/absorbent paper. Put the remaining 2 tbsp oil in the frying pan and place over medium heat. Stir in the reserved porcini and the fresh mushrooms and cook, stirring frequently, for 10 minutes, or until the liquid that the mushrooms release has evaporated and they are tender. Sprinkle in the salt, a generous grind of pepper, and the parsley and mix well. Add the butter to the frying pan, and when it has melted, return the sausages to the frying pan, stirring to combine them with the butter and mushrooms. Raise the heat to medium-high and pour in the reserved porcini liquid. Cook for 3 minutes, or until the liquid is nearly evaporated. Reduce the heat to medium and pour in the cream. Bring the sauce to a simmer, reduce the heat to medium-low, and cook until the sauce is nicely thickened. Stir in the peas and cook for just a couple of minutes, or until heated through but still bright green. Turn off the heat and cover to keep warm while you cook the pasta. Bring a very large pot or a stockpot of water to a rolling boil and salt generously. When the sauce is ready, add the pasta to the boiling water, stir to separate the noodles, and cover the pot. . Drain the pasta in a colander set in the sink, reserving about 1 cup of the cooking water. If the frying pan is large enough, transfer the pasta to the frying pan and gently toss the pasta and sauce to combine thoroughly, adding a splash or two of the cooking water if necessary to loosen the sauce. Otherwise, return the pasta to the pot and spoon about two-thirds of the sauce over it. Gently toss the pasta and sauce to coat the noodles evenly, adding a splash or two of the cooking water if necessary to loosen the sauce. Transfer the dressed pasta to a warmed serving bowl and spoon the remaining sauce over it. Sprinkle with the Parmigiano and serve immediately. It looks so glossy and delicious. Yum!